Opposite a bustling shopping centre on the Kahekili Highway in Kaneohe, below the Koolau mountains, nestles a little piece of Japan tucked away in Hawaii. The Valley of the Temples Memorial Park contains oriental gardens and koi ponds, a massive nine-foot Buddha statue, Japanese Tea House and an exact replica of Japan's 900-year-old Byodo-in Temple, the original of which stands in Uji near Kyoto. The temple was recreated to honour the first Japanese immigrants to Hawaii. 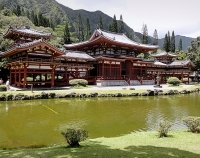 Admission: Byodo-In Temple grounds admission: $4 adults, $2 children.